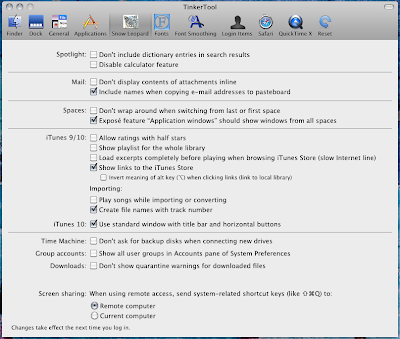 TinkerTool is a utility for Macs that allows you to easily configure hidden OS features. It's pretty handy even if you only use it for one or two things. Here is a rundown of the latest changes. Added preference for Snow Leopard and iTunes 10 to use a standard window with title bar and horizontal buttons for controlling iTunes. Added preference for Apple Mail to prefer the plain text alternative when displaying messages. Added preference for the Dock of Leopard and Snow Leopard to automatically hide all other applications when using the Dock to switch to or launch an application. Added preference for Safari 4 and 5 to disable all RSS features. Changed the layout of the General pane to enhance compatibility with small screens. The Dashboard settings have moved from the General to the Applications pane. 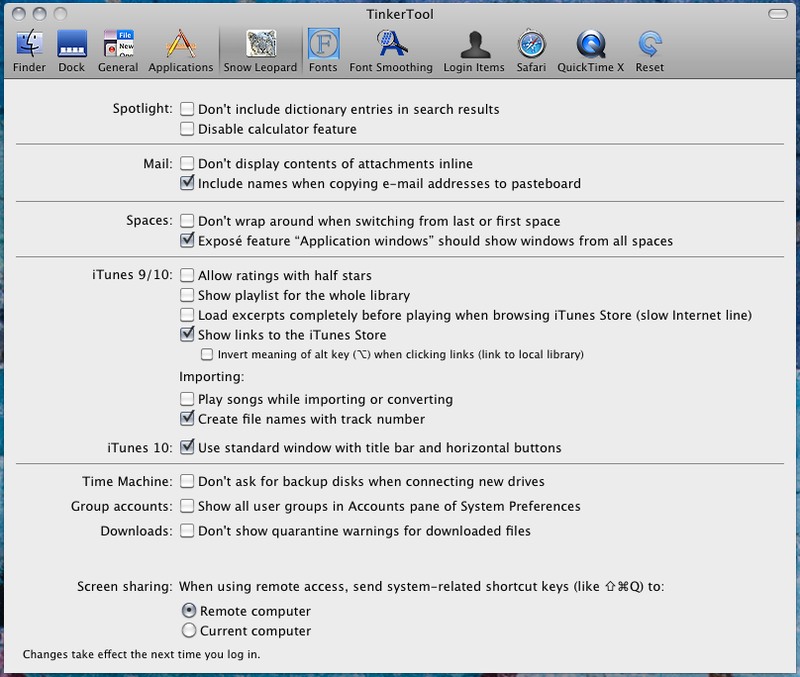 Changed the layout of the Snow Leopard pane to enhance compatibility with small screens. Enhanced compatibility with Safari 5. Corrected a problem where reactivation of deactivated login items was not working as expected in Leopard and Snow Leopard. You can find a complete change log here - TinkerTool: What's new? Personally, it's worth the download just to put those iTunes buttons back where they belong.